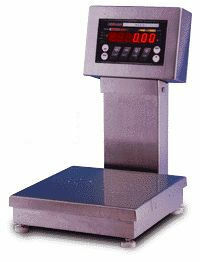 Wash Down Waterproof Check Weighing Scales Service and Repairs at Central Carolina Scale. The SURVIVOR CW-80 features a new generation Tough-Touch keypad, designed to withstand extreme abuse, including knife punctures! A true NEMA 4X/ IP66 indicator enclosure is designed to seal out moisture and contaminants. The exclusive LifeGuard shock-absorbing base provides exceptional protection against overload and impact forces. A stainless steel load cell resists corrosion for long life in washdown applications (6-60 lb capacities only).